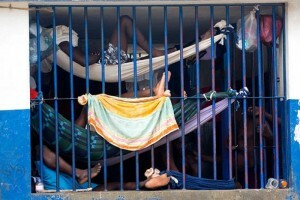 PORT-AU-PRINCE – Officials and NGOs who monitor Haiti’s jails are sounding the alarm about the overcrowding, malnutrition and infectious diseases that have led to a surge of inmate deaths, including 21 at the Port-au-Prince penitentiary in January alone. Prison authorities say they try their best to meet inmates’ needs, but repeatedly receive insufficient funds from the state to buy food and cooking fuel, leading to deadly cases of malnutrition-related ailments such as beriberi and anaemia. “Whenever the money is late it’s the prisoners who pay,” said National Penitentiary Director Ysarac Synal. Inmate Vangeliste Bazile was a little blunter: “Straight up: This is hell. Getting locked up in Haiti will drive you crazy if it doesn’t kill you first,” he said. Bazile, a homicide suspect, is among the roughly 80 percent of those incarcerated who have not been convicted of a crime but are held in prolonged pre-trial detention awaiting their chance to see a judge. A report by the Associated Press painted a grim picture: “Dozens of emaciated men with sunken cheeks and protruding ribs lie silently in an infirmary at Haiti’s largest prison, most too weak to stand. The corpse of an inmate who died miserably of malnutrition is shrouded beneath a plastic tarp. “Elsewhere, prisoners are crammed shoulder-to-shoulder in cellblocks so overcrowded they have to sleep in makeshift hammocks suspended from the ceiling or squeeze four to a bunk. Haiti’s penal system is by far the most congested in the world, with a staggering 454 percent occupancy level, according to the most recent ranking by the University of London’s Institute for Criminal Policy Research. The Philippines comes second with 316 percent occupancy. Inmates, some waiting up to eight years to see a judge, contend with widespread malnutrition and rats scampering through cells made for 20 men but now crammed with 80 to 100. “Only the strong can make it in here,” said Ronel Michel, a prisoner in one of the crumbling cellblocks where exterior walls are stained with dried faeces because the men have to drop their excrement out of barred windows. Not all the inmates are weakened by hunger, however. Some are provided meals by visiting relatives and others are permitted by guards to meet with contacts to bring in food. The majority of prisoners are nevertheless dependent on authorities to feed them twice a day and get little more than rationed supplies of rice, oats or cornmeal. Even clean drinking water is often in short supply. Haiti’s penal system is so overcrowded that suspects are held indefinitely in other cramped pens, including cells at four police stations, where malnutrition is common. Three inmates recently died of malnutrition ailments at a prison in the southern city of Les Cayes, according to the Associated Press. Severe overcrowding is reportedly partly due to rampant corruption, as judges, prosecutors and lawyers join in creating a market for bribes, said Brian Concannon, director of the non-profit Institute for Justice and Democracy in Haiti. “If nine in 10 prisoners is in pre-trial detention, and a person has no prospect of getting a fair trial for years, his family will find some way of raising the funds to bribe him out, regardless of guilt,” Concannon said.